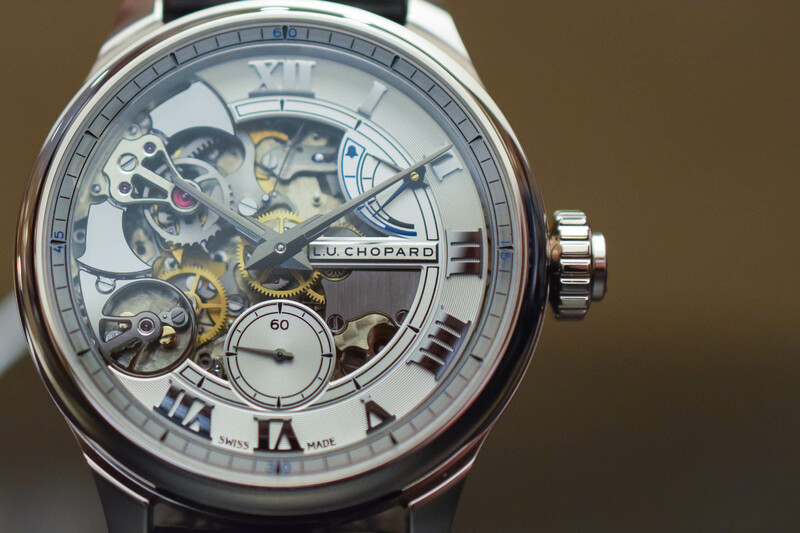 A monochrome white gold version of Chopard's revolutionary Full Strike minute repeater strikes a pose. Following the resounding success of the 2016 L.U.C Full Strike in rose gold with its revolutionary use of sapphire crystal gongs, Chopard presents the second version of its minute repeater in 18k white gold – ‘Fairmined’, of course. Monochromatic with subtle silvery grey details on the partially openworked dial, the white gold model is even less conspicuous than its predecessor but packed with all the marvellous technical goodies and distinctive chimes that won this watch the coveted Aiguille d’Or prize at the Grand Prix d’Horlogerie de Genève Awards (GPHG) of 2017. 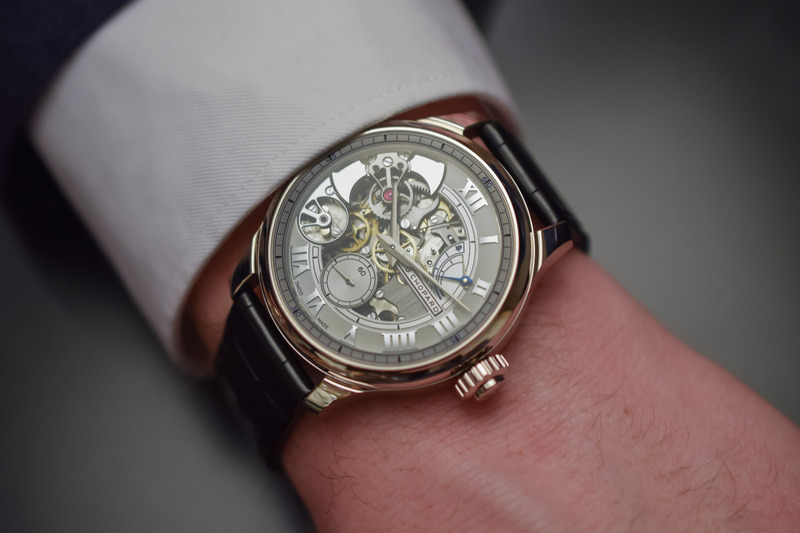 To coincide with 20th anniversary of its high-end L.U.C watch manufacture in 2016, Chopard pulled out all the stops and unveiled its first minute repeater, the L.U.C Full Strike. After six years of R&D and three patents, Chopard was ready to wow the world with its impressive and thoroughly innovative interpretation of the minute repeater. 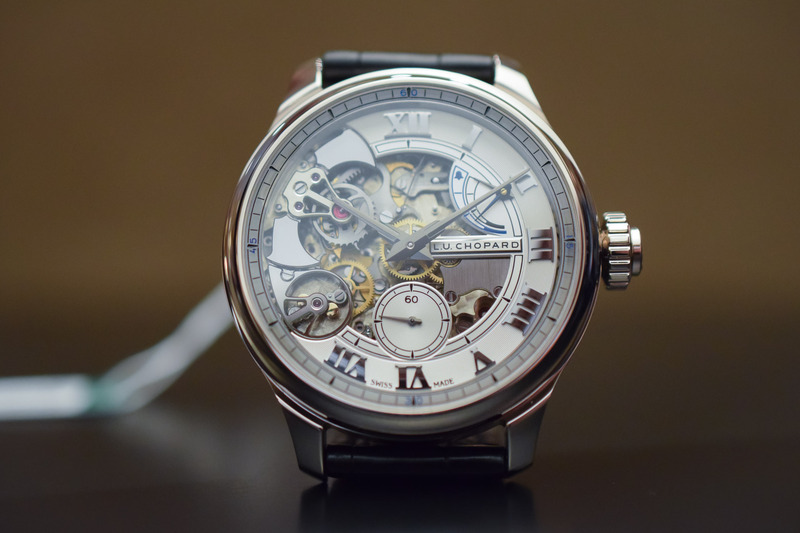 With its unique triggering of the chimes via the crown and its non-humming strike governor, the L.U.C Full Strike played an entirely different tune from traditional minute repeaters with its – literally – crystal-clear sound. Equipped with transparent sapphire crystal gongs that produce a clearer, purer tone than metal, the sound (tuned to notes C and F) is akin to someone tapping a wine glass with a knife. Packed with such original and ingenious technical solutions, the L.U.C Full Strike is considered one of the most innovative minute repeaters on the market today. 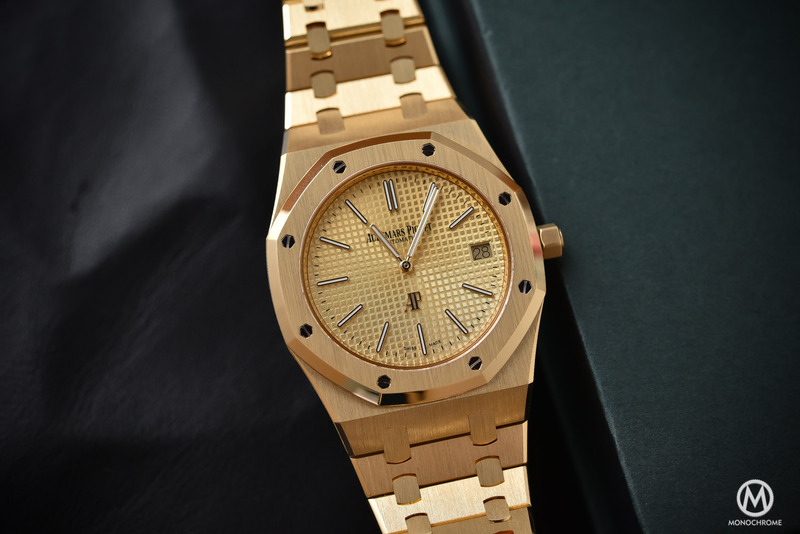 However, just before we review the technical aspects, let’s take a look at the external features that distinguish this white gold model from the original rose gold model. What really takes you aback about this white gold model is its low-key presence, clearly designed to be worn on the wrist and not hidden away in a safe. In fact, if it weren’t for the hammers visible on the dial at 10 o’clock, you could be forgiven for missing the minute repeater functions – especially since there are no tell-tale pushers on the side of the case. Crafted in 18k Fairmined/ethical non-rhodium plated white gold, the 42.5mm case of L.U.C. Full Strike obtains its special glow thanks to the high content of palladium in the alloy. 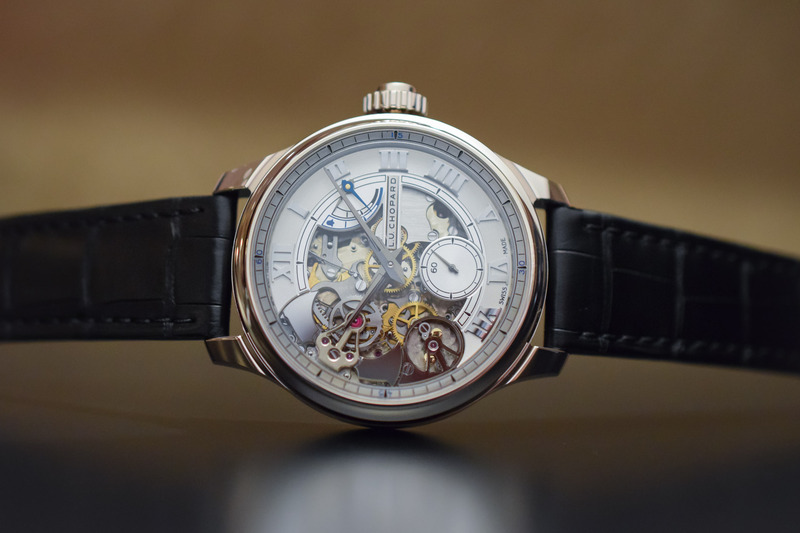 While the elements and layout of the openworked dial are exactly the same as the rose gold model, this version emits a slightly more austere and chilly character than its predecessor. To downplay any brutal contrasts and create an almost monochromatic visual experience, the solid white gold dial displays a galvanised silver tone and the Roman numerals and hands have been plated with black rhodium. Chopard’s commitment to incorporate the use of 100% ethical gold from July 2018 in its jewellery and watch production was a bold move and positions the brand as the leader of sustainable luxury. Announced during Baselworld 2018 in the presence of a star-studded celebrity cast, Chopard’s manifesto defines ethical gold as “gold acquired from responsible sources, verified as having met international best practice environmental and social standards.” When asked about the impact on price using ethical gold across production, Chopard co-president Karl-Friedrich Scheufele responded: “it’s like organic food: people are prepared to pay more.” Even the strap of this watch is ethically-sourced and the alligator leather is CITES-certified and dyed with plant pigments. 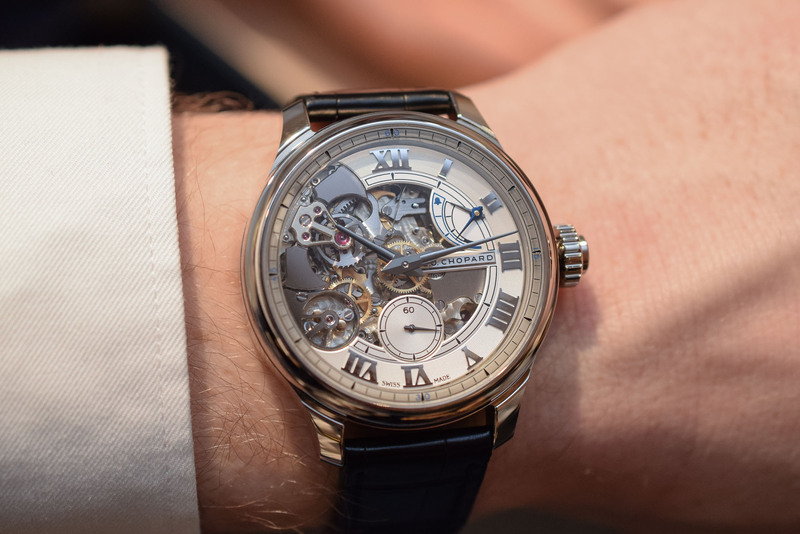 Covered in extensive detail on MONOCHROME when it was released in 2016, the innovations contained inside the case of the Full Strike minute repeater are so ingenious that a brief summary is in order. Unlike conventional minute repeaters with hammers striking metal gongs, the chimes of the L.U.C Full Strike are produced when the hammers strike the sapphire crystal gongs. What is even more unusual is that the gongs and the glass on the dial are machined from one solid block of sapphire crystal, which is notoriously difficult to machine (just ask Richard Mille about his cases). Chopard admits that this patented sapphire monoblock solution, which eliminated the need for glue or screws, took more than three years of development. And just in case you’re worried that the glass might crack, the sapphire crystal was subjected to over 1.5 million hammer impacts in Chopard’s labs and emerged unscathed. In addition to the sapphire crystal’s role in generating the sound, it also acts as a resonator and acoustic amplifier. 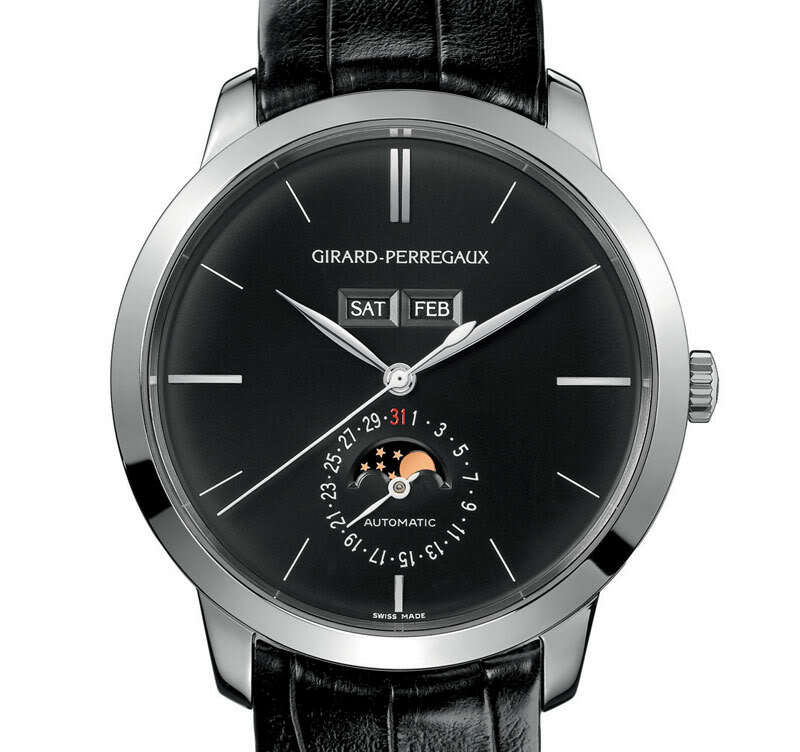 Minute repeaters perform thanks to the presence of a strike governor, the component responsible for synchronising the striking mechanism, which you can see on the dial at 8 o’clock. To enhance the auditory pleasure, Chopard has managed to silence the characteristic humming sound of the strike governor and has eliminated the awkward and often unpredictably long silence that occurs between the last chime of the hours and the first of the quarters. Unlike traditional minute repeaters, the hours, quarters and minute gear trains of the L.U.C Full Strike are superimposed and when one has finished, it triggers the next, maintaining a constant cadence and automatically skipping the silences. It’s hard to believe that over 500 parts are packed into calibre 08.01L. 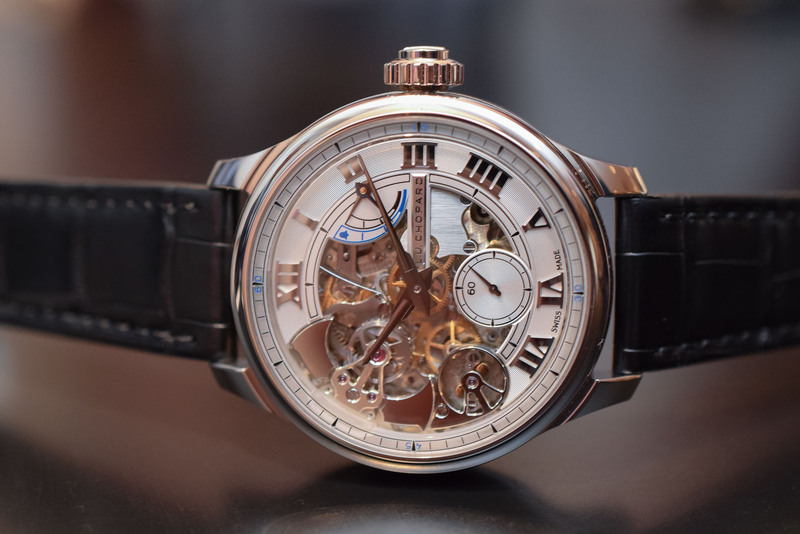 With a modest case height of 11.5mm, the L.U.C Full Strike is fitted with two barrels, one to provide energy for the time functions, the other for the minute repeater. This solution means that there is no need for a traditional winding lever to power up the chimes and hence the lack of this feature on the case band. 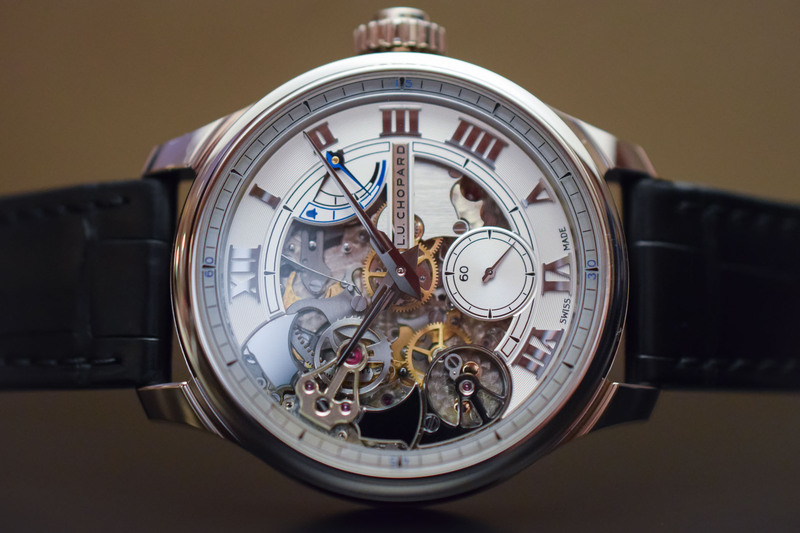 Everything is performed with the white gold crown; one direction for the movement, the other for the repeater. A double power reserve indicator on the dial allows you to check the energy levels of either barrel. When it comes to energy storage, few can rival the potency of the L.U.C Full Strike, which can strike 12:59 (the longest act in a minute repeater’s repertoire with 12 chimes for the hours, 3 chimes for the 3 quarters and 14 chimes for the minutes) 12 times in succession! Visible on both the dial and reverse side of the watch, the manual-winding movement of the L.U.C Full Strike is a labour of love and, along with the case, is covered by the Hallmark of Geneva. Meticulously finished with circular and straight graining, as well as Côtes de Genève motifs, the movement is also chronometer-certified by COSC and oscillates at 28,800vph with a power reserve of 60 hours. The mainplate and bridges are made from non-treated German silver, and combined with the black polished steel hammers and straight graining on the visible parts on the dial, conspire to give it a modern, slightly industrial appeal. 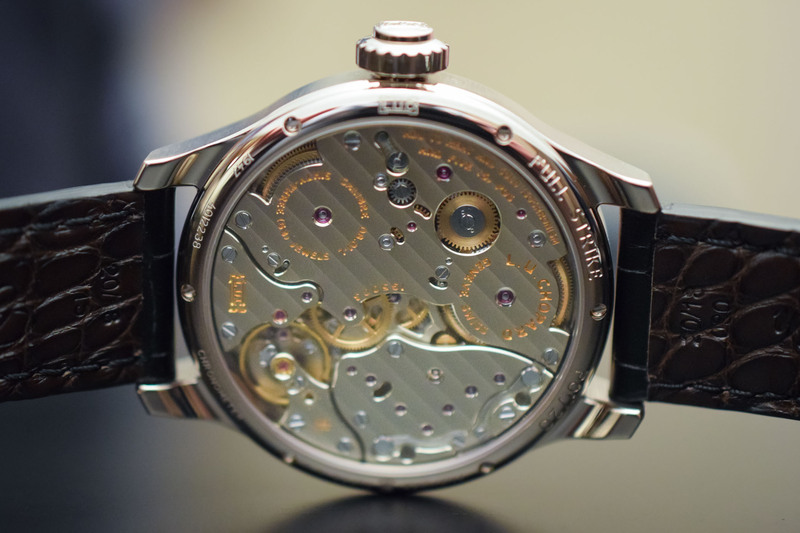 To protect the movement from any handling mistakes and damage, Chopard has equipped the watch with seven safety devices. 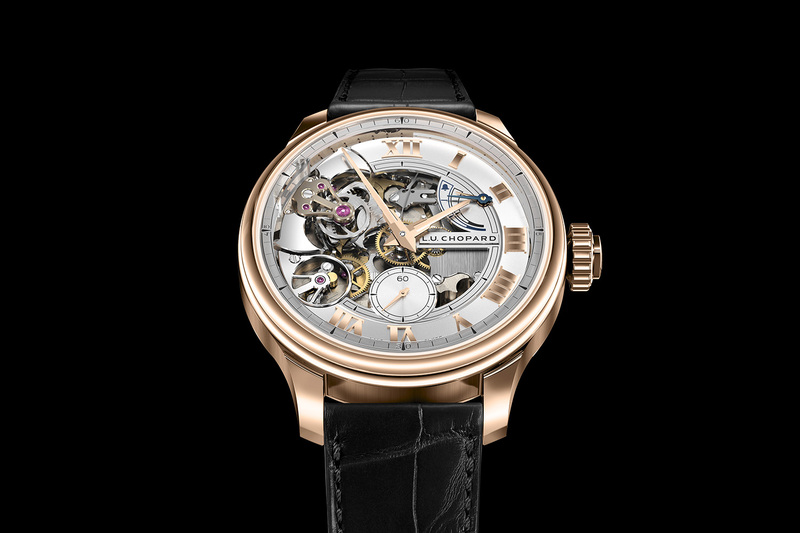 A limited edition of 20 watches, the L.U.C Full Strike in 18k Fairmined white gold comes on a black alligator strap with a cognac leather lining and a white gold pin buckle. 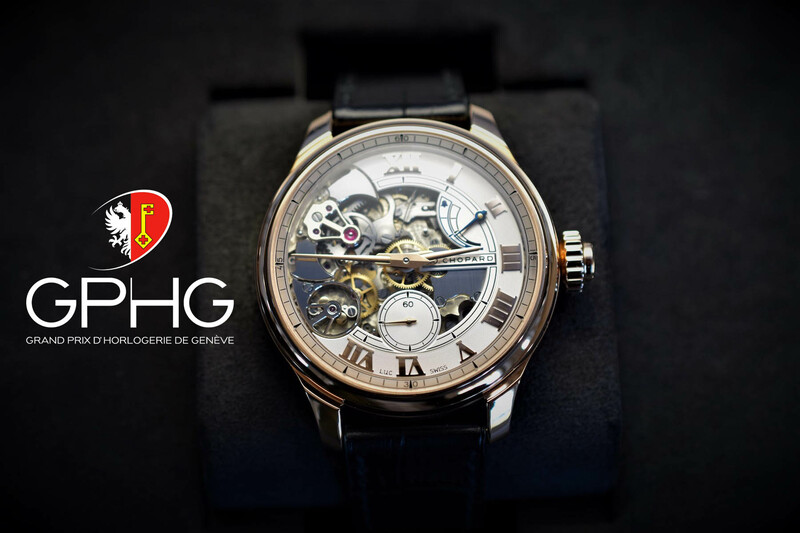 The watch retails for EUR 242,000 or CHF 255,000. 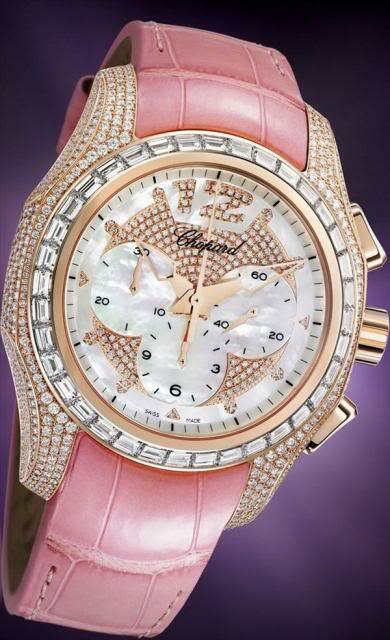 Please consult www.chopard.com for more details.